The first weekend of 24-hour drinking appears to have begun without the widely-feared wave of alcohol-fuelled debauchery and violence. Police had warned the weekend would be an "unknown quantity", with thousands of bars, pubs and clubs in England and Wales extending their usual hours. Some forces even said they had a quieter night than usual, but many put this down to the cold weather. Officers say the full implications will not be clear for at least six months. About 1,000 premises now have 24-hour licences, with thousands more licensed to extend opening times by only one or two hours. Low levels of trouble reported by pubs which stayed open late on Thursday, the first night under the new rules, were repeated throughout England and Wales on Friday night. A Merseyside Police spokesman said there had been no noticeable difference in the level of drink-related crime. Inspector George Dawson said: "I don't think it's been any busier than any other Friday night. "There were no serious violent incidents related to drink." But a police crackdown on anti-social behaviour was mounted in the area to coincide with the legislation. Early indications in Kent and Sussex were that there had been no rise in drink-related crime compared with previous Friday nights. Some officers said there appeared to be fewer incidents and put this down to the cold weather keeping people inside. A police spokesman said: "Nobody wants to fight in cold puddles and people tend to behave themselves when it is icy." The cold weather is also thought to have dampened drinkers' appetites in Bournemouth. Local MP Tobias Ellwood, who went on patrol with Dorset Police on Friday night, said: "The coldest night of the year is not the best time to judge the introduction of 24-hour licensing and the new Mediterranean culture being introduced." Dorset Police said the total of six arrests they made during the evening were not unusual. Police in Yorkshire, and Northumbria and South Yorkshire all reported "typical" Friday night levels of crime. The only difference was that while we are usually busiest at 11.30pm that time has changed to 12.30am. A South Yorkshire Police spokesman said: "The new laws are not making that much difference to be honest as we do not have masses of premises open 24 hours." A Hampshire Ambulance spokeswoman said that Friday night had been normal. "The only difference was that while we are usually busiest at 11.30pm that time has changed to 12.30am." Police in North Wales also said they had no particular incidents in their area in relation to the new licensing arrangements. But they warned that it was still too early to tell whether there had been an increase in violence because of the changes. 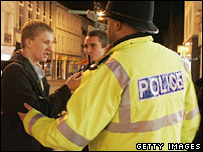 The Metropolitan Police have also said it could take time for the full impact of the licensing changes to become clear. Officers are predicting the full implications will not be clear for at least six months of a year. However, a nightclub in Romford, Essex was closed on Friday night on the grounds of alcohol and drugs abuse. The TRAX nightclub was raided in a pre-planned drugs operation and seven men were arrested. Police are seeking to revoke the club's license under powers introduced in the 2003 Licensing Act. On Thursday, Secretary of State for Culture Media and Sport Tessa Jowell defended the new law, saying it gave police "unprecedented powers to crack down on alcohol-fuelled violence." Has anything changed, 12 months after licensing shake-up? What do you think of new laws?